Sign up for free and just shop with Carphone Warehouse as normal. Our members earned £60,000+ at Carphone Warehouse in the past month. Excludes iD Mobiles & 1 month contracts. 1 Month SIMO - (excl iD & Virgin): Cashback is awarded after three months of contract being active. Cashback is not payable on Huawei Y3 ID Mobile 150mins/5000texts/250MB £5 a month tariff, iD Mobile £5pm 500mb data SIM Only and iD Mobile £7.50pm 1GB data SIM Only. Cashback is not avaliable on on Samsung S6 32GB on Vodafone 500 minutes / unlimited texts / 500MB data for £22 per month deal. Cashback can be earned per one transaction. Carphone Warehouse cashback can be earned simply by clicking through to the merchant and shopping as normal. Carphone Warehouse Cashback is available through TopCashback on genuine, tracked transactions completed immediately and wholly online. Cashback is not payable on PAYM contracts or upgrades where a voucher code is used. Cashback may initially track at a lower rate before being uplifted once confirmed. There is no cashback on any other categories (including Pay As You Go, SIM Only, Handset Only, Tablets and Accessories) unless stated otherwise. All Sim Only cashback rates do not include a handset, the new iPhone is not included in these offers. Get the latest handset for the best price by comparing mobile phone deals and making bigger savings with our Carphone Warehouse discount code and cashback offers. Whether you are looking for a pay as you go, SIM-free or pay monthly phone, you will find popular handsets like the iPhone 7, Samsung Galaxy S8 and Sony Xperia XZ Premium, while they also offer EE, Vodafone and O2 mobile network upgrades, as well as pay monthly, pay as you go and tablet data SIMS and accessories. Not only can you upgrade with Carphone Warehouse even if you have not bought from them before, you can also keep your number and all of your network benefits - and get it at a better price with their Additions on top. If you are happy with your current phone, or want to wait for the next big smartphone release, you can opt for a SIM only deal, which is great for saving money on your monthly bill. Sign up to TopCashback by filling in the form at the bottom of this page and earn discounts with our Carphone Warehouse voucher code deals. Whether you are looking for a new phone on a new network, or wish to stay with your current network, you can use our Carphone Warehouse offers to make your choice from the latest phones and exclusive deals. Browse Apple iPhone and Samsung Galaxy models, as well as the latest handsets from BlackBerry, HTC, LG and more. Go for a 4G model or narrow down your search by entering details of how much you would like to pay per month and up front, while you can also select the features, operating system (Android, iOS, Windows), style and colour you are interested in. If you are searching for accessories for phones and tablets, meanwhile, you can buy wearable technology, screen protectors, headphones, memory cards, chargers and more, which you can search for by phone model. If you’ve already got your eye on a Carphone Warehouse deal, then make sure to check our cashback offers above to see if you could get money back. Anyone not set on a phone yet can shop savvy by checking out the Carphone Warehouse’s special offers section, and browse the exclusive online-only pay monthly, sim and tablet contracts. Other specials include the likes of saving up to £200 when adding a SIM to a SIM free phone or select contracts that include free gifts such as smartwatches, tablets or gift cards. If you don’t mind pre-owned, then you can save by heading over to Carphone Warehouse’s preowned section to pick up a bargain. You'll find these phones up to 40% cheaper than new, and you don’t have to worry as all devices come thoroughly tested to A grade and even include a twelve-month warranty. For some extra savings you can trade in a variety of old phones and get cash direct to your bank, plus don’t forget that any order placed with the Carphone Warehouse also benefits from free next day delivery. 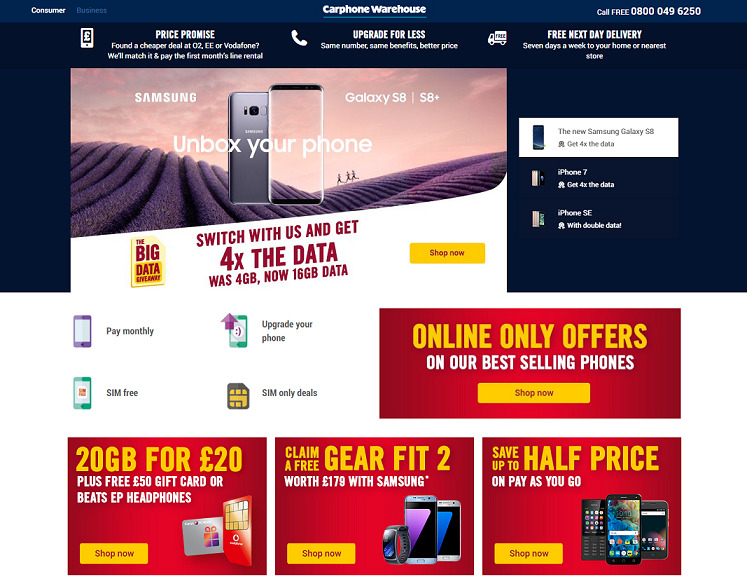 Those who want to be ready for some deals next time their contract is up can sign up to the Carphone Warehouse email newsletter and keep up to date with releases and promotions. Carphone Warehouse offer free next day delivery, seven days a week, on all orders. With free delivery, DPD will send you a text on the day to confirm your one-hour time slot, though this service is unavailable in certain remote locations. If you place an order for a phone, contract SIM card or anything else which is worth more than £50 before 8pm Monday-Friday or 6pm Saturday or Sunday, they will deliver it the next day for free. If DPD is delivering your order, you can choose your delivery day, including weekends, up to two weeks in advance. You can also request Saturday or Sunday delivery, though this service is not available if you live in the Channel Islands. As an alternative to home delivery, you can order online and have it delivered to a Carphone Warehouse, Currys or PC World store with their Click & Collect service. If your items are being delivered by DPD, they will send you a tracking number by email, while if it is being delivered by Carphone Warehouse, the store will tell you when it is ready for collection. When you go to pick it up, you will need to take your order details and the card you used when making the transaction. Carphone Warehouse compare the widest selection of tariffs, networks and phones to ensure you get the best deal. If you find a better pay monthly, pay monthly SIM only or upgrade deal on any smartphone at one of their high street competitors, such as O2, EE or Vodafone, they will not only match it, but will also pay your first month's line rental (terms and conditions apply). Once you have found the right deal for you on the Carphone Warehouse website, if you subsequently discover a cheaper offer elsewhere, you should call their team on the number you will find on the Price Promise page. Give the details of the competitor's deal to a team member and, if eligible, they will match it and send you a cheque to cover your first month's line rental. As well as offering great deals on mobile phones, Carphone Warehouse also compare Broadband and TV deals. They can help save you money by comparing home phone, TV and broadband from a number of major providers, including Sky, Virgin Media, TalkTalk, the Post Office and POP Telecom. Just choose the services you want and enter your postcode to compare services available in your area. When the results appear, you will be able to find the fastest broadband connection for your home, as well as the cheapest. Carphone Warehouse offer the latest mobile phones on a pay as you go or pay monthly basis, including the Samsung Galaxy S8 and iPhone 7. Browse SIM-free phones and SIM-only deals, while you can upgrade, whether you are with EE, O2 or Vodafone. Search for mobile accessories, the latest tech - including smartwatches and speakers - or broadband and TV packages. Why Is Carphone Warehouse Cheaper? Carphone Warehouse compare the widest choice of networks, phones and tariffs to get you the right deal at the best price. They are so confident you will not get a better deal elsewhere, they offer a Price Promise, which means they will match any cheaper pay monthly or pay monthly SIM only deal on any smartphone at O2, EE or Vodafone - and pay your first month’s line rental. What Time Does Carphone Warehouse Close? Not all Carphone Warehouse stores operate the exact same opening hours. To discover which stores near you are open when, or the opening times of a particular branch, click on the ‘Stores’ tab at the top right of the Carphone Warehouse homepage. Enter a town, city or postcode and you will be presented with a list of nearby stores. Click on one and you will be able to see its opening hours. Where Is The Nearest Carphone Warehouse? It is easy to find your nearest Carphone Warehouse. Whilst on their website, just click on the ‘Stores’ tab in the top right corner of the homepage. Enter the name of a place or postcode and it will give you a list of nearby stores and tell you how far away they are from you. Are Carphone Warehouse Phones Unlocked? The majority of the phones they sell are unlocked, including almost all of their SIM-free handsets, allowing you to put any UK SIM card into it for whichever network you prefer. An iPhone will be unlocked if you buy it SIM-free, although Apple’s software means it will lock it to the first network you use with it. When Can I Upgrade My Phone Carphone Warehouse Phone? To see if you can upgrade, you will need to enter your network, mobile phone number and type of contract on the website. Carphone Warehouse will take care of everything for you, including your old contract and bills, while your existing phone will still work and your number will be retained. If you upgrade early, there will be no overlap of contracts - they will switch you over early. Order any phone or pay monthly SIM card and it will arrive the next working day if placed before 9pm Monday-Friday. You will receive an email when your order has been accepted and is on its way. Your order may be delayed if (1) there is a stock shortage, (2) they cannot get security clearance straight away, (3) there are queries regarding your credit check or (4) you are not in to sign for delivery. Carphone Warehouse offer free next day delivery seven days a week on all orders. They will provide you with a one-hour delivery window, while you will also be able to track the driver’s progress on a real-time map on your smartphone. If you are not going to be in, they will offer alternative delivery options, such as leaving the parcel with a neighbour or changing the delivery date. How Do I Cancel My Phone Insurance? You can buy Team Knowhow Mobile Complete insurance by calling the number you will find in the help section or by visiting a Carphone Warehouse store. You can only sign up for insurance within 30 days of buying or upgrading. You can upgrade your cover within 30 days of signing up and downgrade at any time. The easiest way to cancel the insurance is by calling them on 0800 049 0221. What Network Does Carphone Warehouse Use? iD, which is the 4G network from Carphone Warehouse, uses the Three network. All iD plans include 4G as standard, while their pay monthly plans include free data rollover, which allows you to carry unused data over to the next month. Their plans also let you use calls, texts and data in 50 destinations. Earn exclusive cashback across a wide range of products when you buy from Carphone Warehouse. With deals cheaper than going direct to your network, Carphone Warehouse is the best place to buy your new iPhone, Samsung Galaxy, SIM Only or SIM Free handset! Keep your number, receive free next day delivery and get the best deal around.